Have you tried a simple search at MyTrees.com and gotten so many results that you weren't sure what to do next? Or perhaps you did not get a meaningful result for your search. Here are a few tips for searching that may help you identify the database that may hold the key to your ancestral hunt. First - Search using an ancestor about whom you have at least some data. Data like a birth date or a death date and perhaps a parent's name can help narrow the search result. Another helpful piece of data would be a marriage date and the spouse's name. Second - Use the Advanced Search screen. The Advanced Search has the entry box for the middle initial. Don't enter the middle initial unless your ancestor has a very common name and entering the middle initial is the only way to distinguish them from the rest of the people of the same name. The Advanced Search screen also allows relationship searching. This screen is where you can enter the spouse's name and the marriage date to help narrow the results. An approximate marriage date can be estimated by either using the birth date of the first born child of your ancestor and subtract one year from the child's birth date. 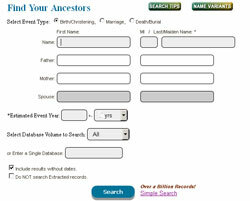 Using the birth date of your ancestor and adding 20 years to it would be a good estimate for their marriage date also. Alternatively you can use a part of the parent's name to narrow the result using either the approximate birth date or death date. Third - Using the Advanced Search screen., enter a specific database name over which to search. Choose a database name from the results list and enter it into the last entry box in the Advanced Search screen which is labeled "Enter a Single Database". Now enter ONLY the last name of the ancestor in the last name field and a very broad range of dates. The results may surprise you. Fourth - Search for the spouse only. Recently I was searching MyTrees.com for Almon Stratton and his wife Ovelia Peck. I had already tried a search entering them as a couple in the search screen. I found only one database. I then searched just using Ovelia Peck and there were two resulting databases as a match. The reason that the search had not returned the second database previously was that the database owner had included an alternative spelling for Almon's last name in the last name field and worse he had hyphenated them and therefore the search engine did not pick that data up as a result. Fifth - Search using Google with the site:mytrees.com as part of the search. Many of the families listed on MyTrees.com have been indexed by Google and if you designate the website as site:mytrees.com Google will show the databases it has indexed which have the names you have listed in your Google search. Often the result that is shown is a family group record with notes. Sixth - Try searching in the Advanced Search Screen with only the last name of your ancestor and the last name or first name of their spouse and of course the approximate marriage date. This is done when you know there are multiple alternate spellings or nicknames for your ancestor. Also, you might consider trying the Location Search or the Top 200 Names search. These searches do not include all the pedigrees that are on the MyTrees.com site but the result is displayed as a family group record with notes, even if you are not logged into an account. Lastly, if you are not finding your ancestor on MyTrees.com , try posting a query for help on the forum.MyTrees.com and perhaps someone will answer your post and provide that ancestral bit of information about which you have been searching.